Hands up, I find the Munster National one of the toughest races on the jumping calendar to nail. In fairness the past couple of Irish races I’ve tackled on the free blog in the ‘off season’ haven’t really gone to plan! It’s annoying, but that’s the racing game. It might be a well worn cliche, but this punting game is a long-term one so you take the rough with the smooth, because if you don’t you go bloody crazy! Knowing this wasn’t one of my ‘strong races’ I revisited the trends I use for this race, gave them a bit of a shuffle, a bit of a strip down and filtered them through a fine trends sieve until a fresh set to work with came out (plenty of the old ones survived the cull but it’s a fresh ‘set’, as such). Like it’s Kerry National partner in crime from last month it’s again one of those early season races that isn’t quite strong enough to add to the full NTF subscription service but does serve it’s own purpose for me in that I can use it to get my eye in for the season ahead. I’m just about to open the doors to the full NTF service to members of the free list next week so it never hurts to get in a few more ‘practice swings’ to get my jumping eye fully back in focus, the start-middle of October is often a tricky wee period on the jumping front. Well I say ‘practice swings’ but I’m very much playing for real, there won’t be no paper trading here, those days are long gone. Munster National you will be mine one of these days…One.Of.These.Days!! As always you don’t have to side with my selections, there is plenty of analysis in the guide that you can utilize for your own thoughts and workings. WITHOUT LIMITES (Miss E Doyle) – Still very much unexposed after only 5 chases starts (13 career starts) and he’s one that will certainly love the testing ground, with all 3 of his career wins coming on Heavy ground. He starts this season on OR 128 and on the best of his form from last season that looks a workable mark, the light weight he carries here (aided by his 3lb claimer) also won’t harm his chances in the testing conditions. TIMIYAN (G Elliott) – He pretty much lost his race at the first last time out in the Kerry National (bad mistake and knocked him right to back of pack) and he’s better judged on his victory at Kilbeggan the time before, where he stayed on strongly after the last to land the Midlands National. Those have been his only 2 starts over a staying trip to date so he comes here unexposed over these longer trips, but they do look to be where his future lies. He already has a heavy ground win from his hurdling days, so the ground shouldn’t be an issue, and he looks a lively outsider. 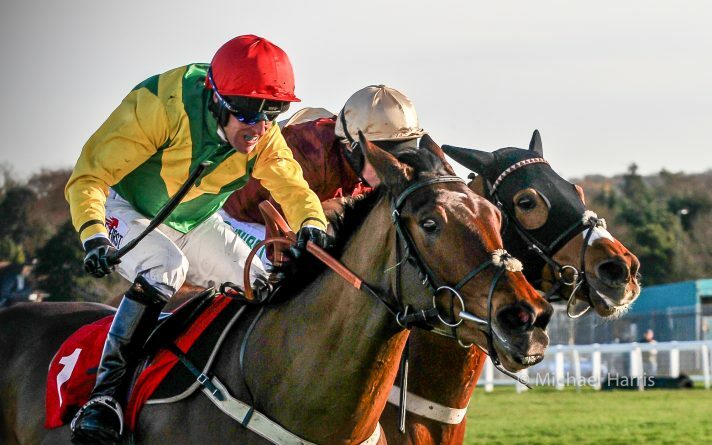 This is likely to be the last piece of free race analysis on the blog for a while as this side of NTF will be moving to the full members service for the remainder of the season. Best of luck if you are getting involved in the Munster National. There’s no confusion, Ben. National Hunt tracks ALWAYS ride faster than Flat tracks. It’s a safety issue…if national Hunt horses jump on hard ground the risk of injury is massively increased. Equally National Hunt “soft” would be classed as unraceable by Flat standards. Thanks for the comment. I was just surprised that, considering it had been raining heavily at track for a couple of days, there was such a difference between the two tracks, flat track heavy and jumps track Yielding from Good is quite a difference. No, Ben. The ground is the same but how it rides is interpreted differently according to the code. If it goes in the ground,say, 5cm a “flat meeting would class such ground as “good” going, but a N.H. meeting would class it as “good to firm”. It’s just a way of interpreting the ground, as per the “code”. You could get both but on my race guide it is the pace angle for the specific race. I look at wider pace angles with my other analysis but for the race guides it is for specific races. Good to have the trends holding up as we enter the season ‘proper’. Hopefully a few people were on the winner off the back of the trends.